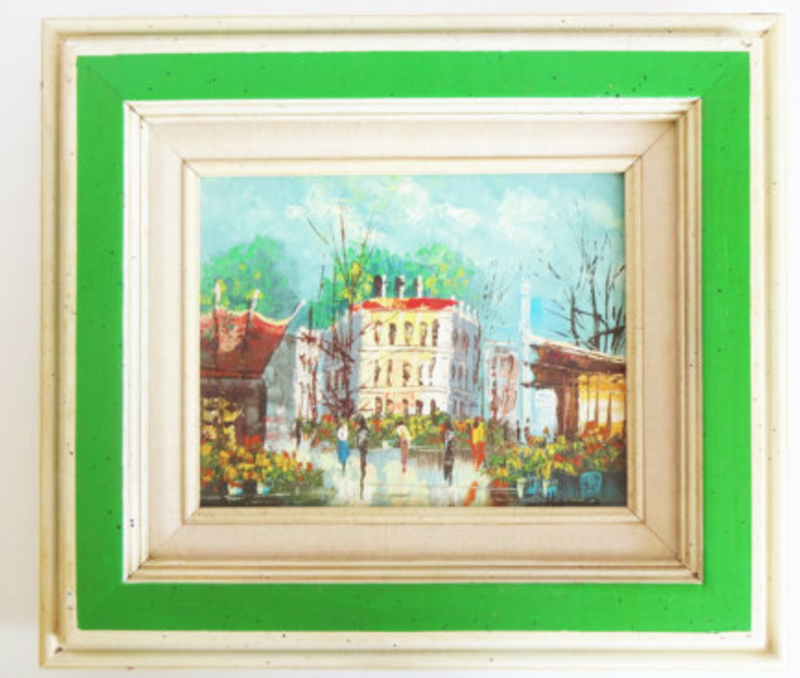 A vintage Paris painting for our bathroom. Oh my word, things have been wild! We are renovating both our bathrooms, and the exterior of our house is being repaired and painted. Not only is my anxiety running wild (having people in our house is a huge trigger for me), but we have also had some issues with our contractors communicating with us, and things have been up and down in that regard. One of the good things is that the design has been 100% in my control. I picked every feature of the bathrooms, and the paint colors for the exterior. Our guest bathroom is going to have a mid century modern feel, and our master bath is going to have a 1920s/bohemian feel. I am thrilled about both and can't wait to see the finished product. I have ordered most things online so am hoping that the vision I have in my head is accurate and that everything will go together! I'm realizing that during this time I really have to work on self-care. First of all, getting a bathtub and these renovations done is a huge part of self-care on it's own. I haven't had a bathtub that worked for seven years! It's going to help reduce my anxiety as well as my fibromyalgia pain. We also had some issues with dry rot that I'm sure wasn't good for our health. And driving up to a pretty exterior is going to be fantastic! My self-care routine includes the following...Each morning I shower and throw on a cozy dress and some mascara. I tidy the house, light candles and make a list of plans for the day. Mainly I sit around watching movies as I am trying to keep our crazy dog Cricket who barks most of the day calm, so spending time cuddling pups is a big priority. I've also baked most days (today chocolate crinkle cookies), and plan a simple dinner. Each night I take Melatonin to help reduce my anxiety enough so I can sleep. One other thing I set up today is my aromatherapy diffuser. It fills the room with essential oil pretty fast and I can run it all day. I usually blend my own water with lavender, frankincense (one of my favorites! ), and rose oil. Having an anxiety disorder and four nervous dogs isn't fun during stressful things like this. I am doing my best to hold it together, but it's rough. I know in the end it will be worth it! Can't wait to take a bath with a fancy Lush bath bomb! My next post will be about how the way we care and set up our home really affects our state of mind and can be a form of self-love. I'll share some fun ideas and thoughts. So stay tuned! Thank you! Yes, everyone needs a bathtub!!! I can't wait to show you how the bathrooms turn out!